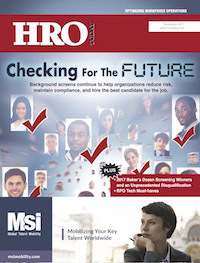 Universal Background Screening Named #1 Background Screening Provider by HRO Today Magazine. In the largest pre-employment background screening study in the Human Resource Trade Media, Universal Background Screening was named the #1 Provider for Quality of Service. HRO Today magazine, the publisher of the annual Baker’s Dozen Customer Satisfaction Survey, recently released the results based on surveys completed by over 850 employer representatives about their experience with background check providers. Among the rankings, which include breadth of service, size of deal and quality of service, Universal was named as the #1 Provider for Quality of Service and the second-highest provider overall. The announcement marks the 8th consecutive year that Universal Background Screening has been recognized by the HRO Today survey, and the second year in a row that the company has been named the #1 Background Screening Provider for Quality of Service. “Universal Background Screening takes great pride in our commitment to Compliance, Report Accuracy and protection of Applicant Rights, and we are honored to be recognized again this year by our customers and by HRO Today magazine for the Quality of Service we provide.” said Kevin Olson, Chairman and CEO of Universal Background Screening. Universal is a founding member of the National Association of Professional Background Screeners (NAPBS®) and was among the first handful of Screening Providers to be accredited by the Association’s rigorous onsite audit of policies and procedures across six critical areas: Consumer protection, legal compliance, Client education, product standards, service standards, and general business practices.